Sister Elizabeth Brown, (Sister Regis Marie) CSJ, 79, died Tuesday, February 16, 2016, in the 62nd year of her religious life as a Sister of St. Joseph. 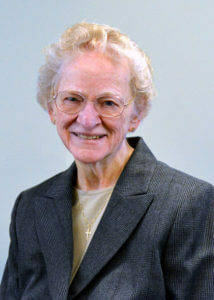 The daughter of Regis and Marie Hauck Brown, Sister Elizabeth entered the Congregation from Holy Rosary Parish, Pittsburgh, PA.
For nearly 30 years, she ministered as an elementary and high school teacher in Pittsburgh and Greensburg diocesan schools including St. Veronica High School in Ambridge, St. Joseph High School in Natrona, Mount Gallitzin Academy in Baden, and Good Samaritan in Ambridge where she also served as Vice Principal. From 1977-1996, Sister Elizabeth, with her excellent mathematical skills, gracefully balanced dual roles as Treasurer for the Sisters of St. Joseph and part-time teacher at Mount Gallitzin Academy. For nearly a decade, she most recently served as Coordinator of Sisters’ Benefits. Described as an outstanding and fair teacher, Sister Elizabeth challenged students to develop their thinking skills and their best gifts. She often volunteered to tutor Girls Hope scholars. An accomplished seamstress, Sister Elizabeth sewed hundreds of habits for novices in the 1950s, and recently sewed, from memory, an authentic full habit, which was donated to the Cambria County Historical Society. She also loved to draw, and occasionally complemented Sisters’ poetry with her artwork. Characterized by her patience, kindness and compassion, Sister Elizabeth was always open to the concerns of the dear neighbors and all of Creation. Sister Elizabeth is survived by one brother, James Brown and his wife, Cynthia, of Pittsburgh, nieces and nephews, grandnieces and grandnephews, and the Sisters of St. Joseph of Baden. Friends will be received Thursday, February 18 from 1- 8 p.m. and Friday, February 19 from 11 a.m. – 2:30 p.m. at the Motherhouse of the Sisters of St. Joseph. Prayer Vigil will be Thursday, February 18 at 6 p.m. at the Motherhouse. Mass of Christian Burial will be offered Friday, February 19 at 3:00 p.m. Burial will follow in the Sisters’ Cemetery on the Motherhouse grounds. Donations in the name of Sister Elizabeth may be sent to the Sisters of St. Joseph Memorial Fund, St. Joseph Convent, 1020 State St., Baden, PA 15005. Make a donation in memory of Sister Elizabeth.